Somewhere in Lebanon County, PA in the late '90s. This is my prior bike, a 1990 Yamaha YX600A "Radian". I bought it used in '94 with only 853 miles (!) on the odometer, rode it for 10 years, then sold it for $50 less than I'd paid for it. 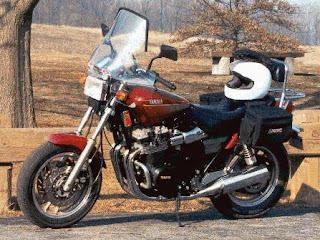 I wasn't into commuting back then, so it saw duty primarily as a Sunday morning backroads machine, though it also took me on 4 week-long trips to Americade and a few shorter trips to the old Rider magazine and Retreads rallies. The prior owner of this Radian purchased it with the OEM engine guards, rare OEM luggage rack/backrest, and the super-rare OEM windscreen. I substituted a larger windscreen and changed the bar-ends, grips and mirrors. Stickier tires, upgraded front brake pads, aftermarket shocks and fork springs, tapered roller steering stem bearings and a slightly higher final drive completed my modifications. I ran soft saddlebags all the time; for long trips I adding a tank bag, and a waterproof duffle bag strapped to the pillion. It was a super-reliable bike that was easy and inexpensive to maintain. It was a rare bike (because it never sold well) that was often better remembered by other riders than was I. Even though I sold the Radian in 2004 after buying my new ZR-7S, I still occasionally hear "aren't you the guy who rode that Radian?" and to this day my handle on the Americade message board is RadianGuy.